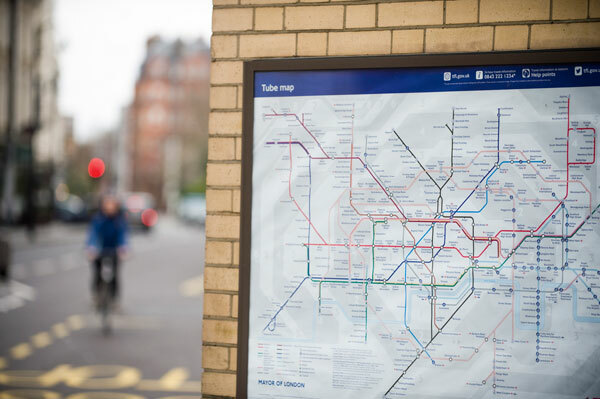 Famous pub-crawl route and an orbital linking London’s radial underground arms, the Circle Line’s yellow circuit is a lynchpin of the capital’s iconic tube map. 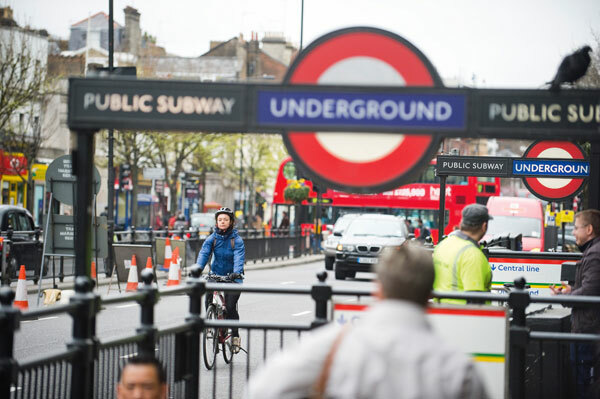 Following mayor Boris Johnson’s announcement in March that an overground ‘cycle tube network’ mirroring the underground lines will form part of his £913 million cycling vision, including a “Circle Line Quietway,” we thought we’d follow the route above ground and see how the land lies. King’s Cross and St Pancras are two of London’s biggest stations, where several tube lines meet National Rail and Eurostar termini. Above ground, however, one of London’s most polluted streets, Euston Road, runs past their front doors, while busy gyratory road systems snake around the east side. On an overcast Wednesday, I square up to Euston Road at the most dangerous time of day: the morning rush hour. Travelling west amid three lanes of packed traffic, buses stop regularly for passengers and vehicles move so quickly any attempt to overtake results in honks and near misses. I find myself waiting in the bus fumes instead. From the cycle path on a slip road pavement above the Euston underpass I gasp at two cyclists actually riding the raceway tunnel. Rejoining the dual carriageway, following multiple close passes at mercilessly high speed, I decide to take the lane, eliciting a: “Do you want to move over, darlin’?” from a taxi driver behind me. I don’t, I’m happy having my own lane, actually. He manages to pass anyway, and I give him a cheerful wave before overtaking him again at the next traffic lights. After Paddington Station I’m soon on quiet streets of grand terraces. A passer-by volunteers that this is “actually a cycle route,” though he seems baffled about what that might mean. 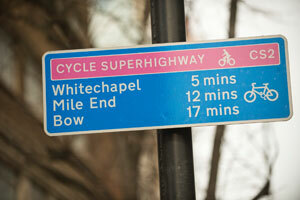 Meandering south-west, just before Notting Hill, one man passes me in a suit on a Dutch bicycle. 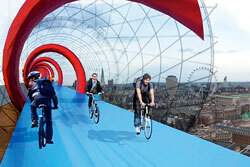 This is the sort of ‘de-Lycrafied’ cyclist Boris wants. But as boroughs control 95 per cent of London’s roads he will need to get them on side to achieve this. At present there is huge variation in the level of councils’ cycling commitments. Through leafy streets to Kensington High Street, rogue SUVs whizzing past, I’m at Gloucester Road in a jiffy and two jiffies later at South Kensington. London, like many UK cities, is eminently cyclable, the average commute only eight miles, or 40 minutes’ pedalling at 20kph. At Sloane Square station I stop to admire a flower stall, promenading pug dogs and sprawling red-brick terraces. Here a ‘shared space’ pavement gives walkers easy access to shops to the west while encouraging drivers to give way. Nonetheless one van driver ploughs over it at speed, mobile phone in hand. Stopping for lunch at Victoria Station, I’m directed down a darkened platform to a handful of bike racks by helpful staff in purple hats. Crossing a ticket barrier I’m assured I can retrieve my bike later without a ticket but can’t help thinking there’s room for misunderstanding. I pass the sobering site where a female cyclist died recently in a lorry collision, before pointing my front wheel at Parliament Square. With four lanes of traffic on parliament’s roundabout I’m not surprised to see a young woman on a bike get off and walk along the pavement instead. 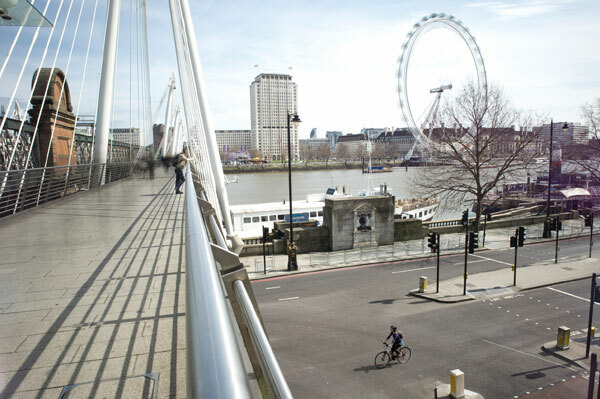 Next up, Victoria Embankment – another proposed site for Boris’s new Cycle Crossrail. Walking on the riverside where segregated lanes will be, with trumpet music drifting from the Southbank in the sunshine, it’s possible to imagine tomorrow’s pleasant boulevard. Blackfriars Bridge soon breaks the spell, however. Mounting a slip road, a frightening motorway-style junction awaits. Unsure when to cross I end up accidentally running a red light. If Boris’s tube proposals are to be effective, points like these will need to be radically reshaped. A tiny segregated lane appears and disappears on the wide road to Cannon Street, before all the craziness and heavy vehicles meet at Tower Bridge, leading me into the purgatory of the Aldgate gyratory. After a 40-metre cycle lane I can’t use, thanks to raised kerbs fencing it in, I struggle to cross two out of six lanes of unforgiving traffic to turn right onto Whitechapel High Street. Incredibly, this marks the start of Cycle Superhighway two (CS2). At Liverpool Street Station I end up on the impassable gridlock of Bishopsgate, rather than the quiet back streets. Passing Barbican, Farringdon will soon be London’s only station with the Crossrail, Thameslink and tube triumvirate. New granite paving on the narrow street to the station’s east side would be even better traffic-free. In a moment I’m back at King’s Cross and my adventure is over: half reality, half dream. Worryingly my lungs the next morning feel I’ve spent the previous day smoking. Jon Snow recently criticised the largest urban development in Europe around the Eurostar for failing to include cycle provision. 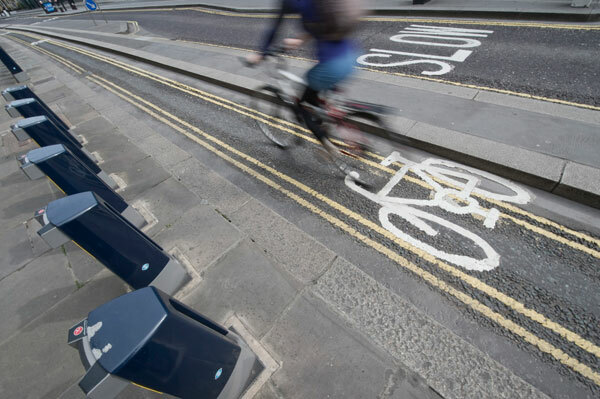 London’s cycling commissioner Andrew Gilligan later said such developments are long-term and it was too late to change the plans once its wheels were in motion. A cyclist died here in 2011, and nothing has yet changed to make it safer. 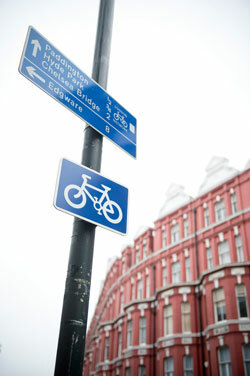 A reversal of the area’s gyratories and introduction of segregated cycle lanes would be a start. Its width as it heads towards Marylebone Road makes it ideal for a segregated superhighway, though something needs to be done about the air. According to 2008 figures around 4,300 people die in London each year due to poor air quality, and this is one of London’s most polluted spots. Praed Street, at the front of the station, seems too narrow for segregated lanes and too busy for “shared space” with one lane in each direction where taxis and delivery vehicles stop regularly. If you could follow the Westway in the future – on Boris’s Cycle Crossail – round the back of Paddington, Bishop’s Bridge Road is nice and wide, and seems perfect for cycle lanes. blocking one of three Westbound lanes outside the station, cars straddle the other two, leaving space aplenty for a bike lane. Railings in the middle of the road waste space, while some advanced stop lines at the traffic lights would be nice. The Royal Borough of Kensington and Chelsea introduced shared space on Exhibition Road between the V&A and Natural History Museum, though surprisingly aggressive drivers in this part of town serve as a reminder that tackling driver behaviour is essential for cyclists to feel safe sharing these streets. There is a case for a 20mph limit here. The Mayor wants mass cycle parking in London, probably at Waterloo. Victoria, one of London’s busiest stations, needs it too. Lots of one-way, leafy streets here around green squares could easily be two-way for cyclists. 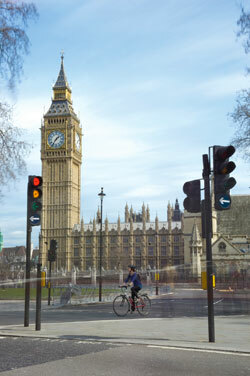 The London Cycling Campaign recently proposed closing the north and west sides of Parliament Square to motorised traffic, making the remaining traffic two-way. This would leave a larger and more inviting space for people, which cyclists could and would use – virtually any route from Green Park to Westminster passes through here. alongside the river, with no side streets, making for a fast, pleasant route. The focus of a series of protests in 2011, the most attracting 2,500 people against new motorway-style road designs, calling instead for better cycle, walking and bus provision. Transport for London went ahead with its plans anyway. The Mayor’s vision makes mention of tackling London’s gyratories. Their design is inherently dangerous as multiple lanes travelling in the same direction creates a racetrack feel, creating a hostile environment for those walking, cycling or living nearby. 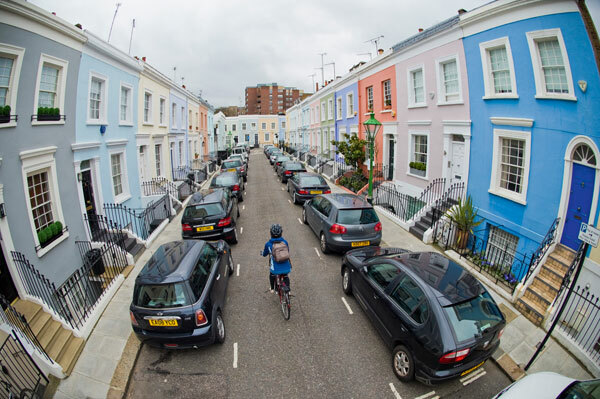 There are clearly challenges for London’s road network, and though bicycles need a lot less space than cars, in some places the challenges are greater than others. Solving the problem of cyclists breathing in dirty air and sidestepping the thorny issue of reallocating road space from cars, bike lanes in the sky – or bolted on to overhead railway tr ain tracks at least – are an interesting proposition. So much so that the mayor has backed the idea. 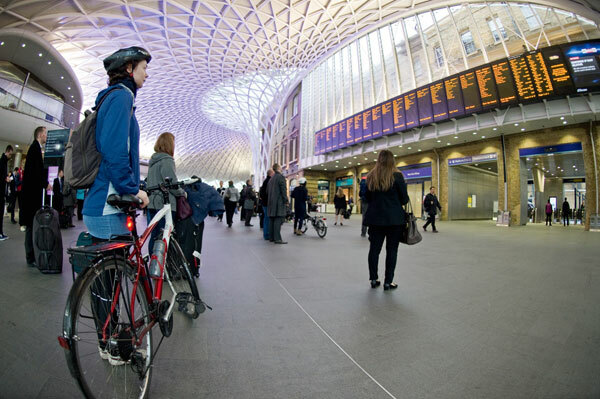 Oli Clark of Exterior Architecture, the company behind the ‘Sky Cycle’ idea, said structures could be built alongside existing rail network for cyclists to ride in from the suburbs, or built along viaducts, of which South London, for example, has many. He says: “It [Sky Cycle] is to get people from the suburbs into the city. “We have got the Mayor’s backing to get private investors involved, and we have still got Network Rail’s support,” he adds. Think leafy green corridors and sneaky peaks into offices, pottering along peacefully admiring the views. Clark admits it is expensive and the routes will need to have dual purpose, carrying services like broadband to be financially viable, but if it works it could beat sucking in the traffic fumes lower down.